For the second year in a row, we were invited to participate in the Girl Scouts of Wisconsin Badgerland Activate! event. We love seeing young girls (and, sometimes, their brothers) get excited about STEM concepts. In an effort to get the Girl Scouts as excited about game design as we are, Game Designer, Abby Friesen, created a fun activity that encouraged participants to use their imagination and create new worlds, characters, and game adventures. This easy, low-cost activity is a great way to get participants using their imagination in exciting and constructive ways. After they were done drawing, we asked the Girl Scouts about their creations. They excitedly described their games about shopping, zombies, searching for gold, and underwater computers. It was great to hear girls discussing different game design ideas with their troops. 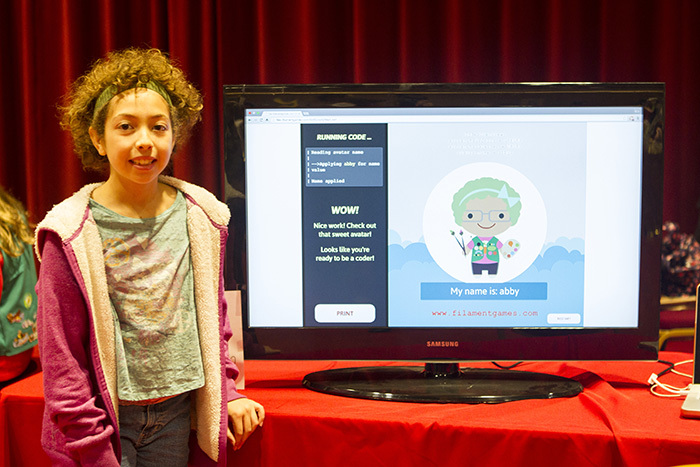 In addition to the game design activity, Girl Scouts were able to experience what it’s like to code their own avatar. Last year we created an app that allowed players to input small pieces of code that changed the appearance of their avatar. It was amazing to see the excitement on the girls’ faces as they learned to code! We wanted to extend a special thank you to Activate! event coordinator, Allison Martinson, for inviting us. Watching kids get excited about learning, science, and game design warms our collective heart. We encourage you to use these short activities in your classroom, after school program, or maker space. Make them your own and see where imagination leads. If you do, we’d love to hear about their experience! Feel free to tweet us pictures or post them on our Facebook wall. Make sure you stop by our Facebook Album to see the amazing game designs submitted by the Badgerland Girl Scouts! The great thing about this activity is that it can be as big or small as you’d like! To prepare for the activity, write topics or ideas on small slips of paper and place them in a basket or bowl. Here are a few ideas to get you started: History, Elephants, Machines, Birds, Shapes, Aliens, Colors, Boats, Outer space, History, Under the Sea, Apples, etc. The list can take whatever shape you’d like. Feel free to customize the topics based on what your students are learning in class! After you have a list of ideas complied, players draw a topic or two from the basket. The rest is up to their imagination. They can draw a scene, character, or entire game based on their selected topics. Let their imagination run wild and don’t forget to have them share their ideas with a group!